The brutal death of former news photographer Henry "Flash" Dahlström awakes the otherwise sleepy, winter-covered island of Gotland. Dahlström was an alcoholic and a regular on the park benches. His death comes after a significant win at the local race tracks, giving credibility to the theory that he was killed for money, most likely by one of the seedy characters from Dahlström's new social circle. 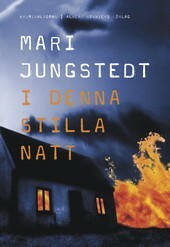 Just as Inspector Anders Knutas becomes embroiled in the Dahlström murder case, 14-year-old Fanny Jansson goes missing. Fanny works at a local stable, and when a co-worker from the USA leaves the country, all suspicions move in that direction. The unlikely turn in the case comes when pictures of Fanny turn up in Dahlström’s dark room, while his death is being investigated. Set on the picturesque island of Gotland a couple of hours south of Stockholm in the Baltic Sea, is known for its spectacular scenery and wild weather. The isolation of the island is the perfect setting for a crime series that plays on the hair-raising feeling that even when you’re alone, someone is watching you. The series follows inspector Anders Knutas, who works at the Visby police where he has worked for thirty years. He has an ailing marriage, and harbours secret feelings for his co-worker Karin Jacobsson, a bundle of energy who is strangely secretive about her private life. Knutas and Jacobsson investigate the violent crimes, that take them into the secluded homes and dark secrets of the Gotland citizens they serve to protect.